I came across this awesome Windows utility today called “Send To Toys.” The standard “Send To” menu is available when you right click any folder or document on your computer. As you can see there are quite a few more options that have become available as well as the ability to create custom links to basically any network folder you’d like. Now how’s this relate to SharePoint? You can create custom shortcuts that will enable you to upload documents from wherever you’d like, without ever touching the SharePoint site itself! For example, you can create a custom link to a particular document library using its UNC path, then using Send To Toys you’ll be able to just right click on any document or folder and “Send To” > your document library! Pretty awesome huh? 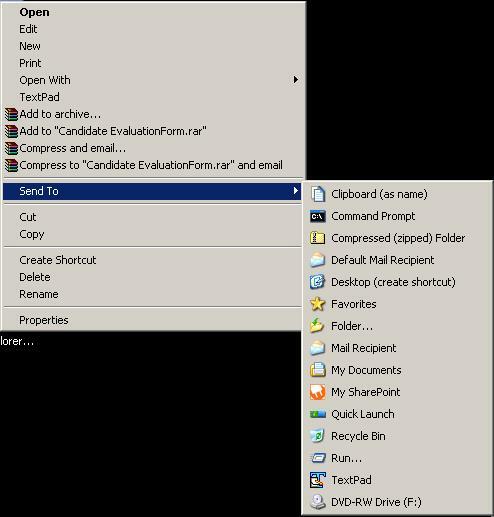 Edit: I should’ve also mentioned that KnowledgeLake also has a similar utility made specifically for SharePoint called KnowledgeLake Connect. But wanna input on few general things, The website style and design is perfect, the subject matter is real wonderful : D.
I can see that you’re an expert in this area. I am launching a web site soon, as well as your information and facts will be incredibly beneficial for me.. Thanks for all of your aid and wishing you each of the good results as part of your home business.